Storylines• The Bulls are 5-1 for the first time since the 1996 season. The last time Buffalo started a season 6-1 was 1959. • A win over Akron would make the Bulls bowl eligible for just the fourth time in school history. UB was also bowl eligible in 2008, 2013 and 2017. • Akron leads the all-time series, 11-6. However, the Bulls have won the last five meetings at UB Stadium. • Buffalo looks to improve to 3-0 in Mid-American Conference play for the first time since 2013. • Kevin Marks has scored a rushing touchdown in five straight games. He is the first freshman in UB's FBS era to do so. • The Bulls are outscoring their opponents 68-13 in the first quarter of games this season. • Tyree Jackson's 17 touchdown passes on the year already rank seventh in school history for a single season. He is one touchdown pass shy of moving into fourth in school history for a single season. • Adam Mitcheson (42) is two field goals shy of tying A.J. Principe (44) for the school record for career field goals. • Khalil Hodge (351) is seven tackles shy of passing J.J. Gibson (357) for fifth in school history in career tackles. 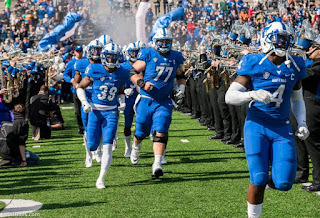 The University at Buffalo football team will host Akron on Saturday looking to improve to 3-0 in Mid-American Conference play. The Bulls are 5-1 overall, 2-0 in the MAC and are coming off a 34-24 win at Central Michigan last Saturday. UB was led by redshirt-freshman running back Kevin Marks who rushed for a career-high 167 yards and a touchdown against the Chippewas. Akron is 2-2 overall, 0-1 in the MAC and is coming off a 41-17 loss to Miami (OH) last Saturday. The Zips are led by quarterback Kato Nelson who is averaging 216 passing yards per game and has thrown seven TD passes. Akron leads the all-time series, 11-6. The Zips won the last meeting, 21-20, at InfoCision Stadium last season. Kevin Marks is emerging as Buffalo's top running back after posting his best performance of the season at Central Michigan. The redshirt-freshman running back rushed for a career-high 167 yards and a touchdown against the Chippewas. It was the best performance by a freshman running back since Jeffvon Gill rushed for 172 yards against Bowling Green on Nov. 3, 2009. Marks is fifth among all freshmen running backs in the nation in rushing, averaging 77.7 yards per game and is tied for second in the nation in rushing touchdowns by freshmen with seven. He has scored a rushing touchdown in five straight games - the first freshman to do so in the Bulls' FBS era (since 1999). The Bulls lead the MAC and rank 12th in the nation with eight interceptions, tying their mark from all of last season. Buffalo had a season-best four picks at Central Michigan. It was the most in a game since picking off four passes against Ohio in 2015. Five different UB players have recorded an interception on the year. Cameron Lewis leads the way with three to rank fourth in the country. Brandon Williams has two. Joey Banks, Devon Russell and Aapri Washington each have one. The Bulls lead the conference and rank ninth in the nation in turnover margin at +8. A pair of freshmen have emerged as the Bulls top running backs this season. Redshirt-freshman Kevin Marks leads Buffalo with 466 yards and seven touchdowns while true freshman Jaret Patterson is second with 299 yards and four scores. Both are making the most of their action as Marks is averaging 5.7 yards per carry and Patterson is averaging 5.6 yards per carry. Khalil Hodge tied a career-high with 20 tackles against Army. It was the second time in his career he racked up 20 tackles in a game. He now has 74 tackles on the season which is tied for third in the nation. Hodge has been in the national rankings since arriving on campus in 2016. He ranked eighth in the nation in tackles following the 2016 season and second in the nation in tackles after last season. He recorded his 300th career tackle against Eastern Michigan on Sept. 15 to become the fastest player in school history to reach 300 tackles. He did it in 27 games. Davonte Shannon, the Bulls all-time leader in career tackles with 461, didn't reach 300 tackles until his 34th career came. He currently ranks sixth in school history with 31 career tackles in only 30 games. Hodge was named the MAC East Defensive Player of the Week each of the last two weeks, following his 15-tackle performance in UB's win over Rutgers and his 20-tackle game against Army. The Bulls have been using big plays to find the endzone this season. 12 of the Bulls' 28 touchdowns on the year have been at least 22 yards. The Bulls have scored touchdowns of 22, 27, 29, 32, 33, 42, 42, 53, 53, 70, 70 and 75 yards over the first six games. K.J. Osborn is enjoying the best start to a season in his career. He leads the Bulls with 27 catches for 490 yards and six touchdowns. He's tied for 10th in the nation in touchdown catches. The Bulls have won all three road games this season (Temple Rutgers & CMU) and have won four straight road games dating back to last year. The Bulls have won six of their last eight road games. UB's win at Central Michigan was its third straight road win of the season, marking the first time since the 2008 season the Bulls have accomplished the feat. Quarterback Tyree Jackson is off to a blistering start to the season, having already thrown 17 touchdowns, five more than he did all of last season. He already ranks fifth in school history for single-season passing touchdowns. Jackson has really found his groove since the end of last season. Over the last nine games, he has thrown for 2,694 yards, (60 comp.%), 26 touchdowns to only six interceptions. Jackson's 17 touchdown passes on the season is tied for eighth in the nation. Harris' six sacks this season leads the MAC and has him tied for 10th in the nation. Serve and ProtectThe UB offensive line has done a tremendous job so far this season. The Bulls are tied for first in the nation in sacks allowed, letting up only one so far on the year. Buffalo has attempted 172 passes through six games this season. In addition, the Bulls rank fourth in the nation in tackles for loss allowed with 20. While many will credit the Bulls' hot start to their seasoned veterans, you can't discredit the play of the youngsters. Nearly half of Buffalo's 29 touchdowns (14) on the season have been scored by freshmen. Buffalo's top two leading rushers are freshmen. Redshirt-freshmen Kevin Marks leads the Bulls with 466 yards and seven touchdowns. True freshman Jaret Patterson has rushed for 299 yards and four scores. Redshirt-freshman Charlie Jones has nine catches for 219 yards (24.3 ypc) and is tied for second on the team with three touchdown receptions. The Bulls have outscored their opponents 68-13 in the first quarter of games this season. The Bulls have averaged 11.3 points in the first quarter this year and 21.2 points in the first half. Tyree Jackson has done a good job distributing the football so far this season. 13 different players have a caught a pass already this year. 13 different players caught a pass all of last season. In addition, six different players have a touchdown catch on the year and five of the six have caught at least two TDs. Not many players in school history made a bigger impact in their first season with the UB football program than wide receiver Anthony Johnson did in 2017. Kicker Adam Mitcheson is just two made field goals shy of the school record for career field goals made at UB. The senior kicker has made 42 field goals over his career. He is currently second all time, trailing A.J. Principe (2007-10) who made 44 field goals over his career. Mitcheson is also on pace to break the school record for career scoring. The Pittsburgh native currently ranks second in career scoring with 240 points. Principe holds the school record with 265 career points. This season, the Bulls will feature two season captains as well as two rotating game captains. Serving as season captains are senior center James O'Hagan and senior linebacker Khalil Hodge. 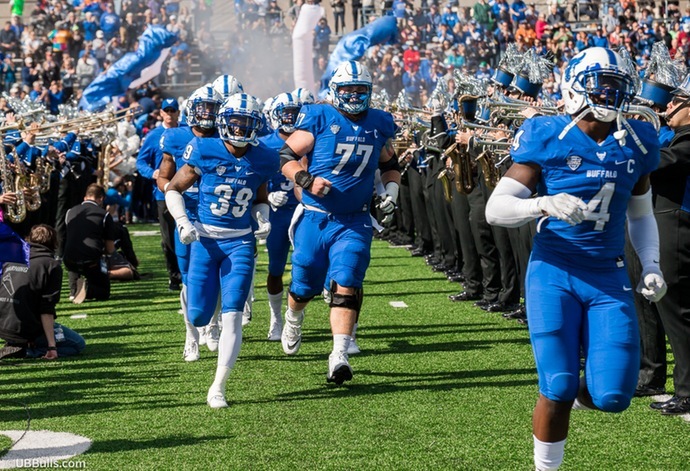 Both O'Hagan, UB's fourth-year starting center, and Hodge, UB's third-year starting middle linebacker, also served as team captains last season. Three graduate transfers from Power 5 programs joined the Bulls prior to the 2018 season. Wide receiver George Rushing, safety Ashton White and offensive lineman Trey Derouen all joined the squad. Peck will host the UB Football Insider with Lance Leipold on Monday nights at 5:00 pm. The show air on ESPN 1520 and will be taped at the Santora's Millersport location.